Sidney Morse edited The Radical, a Boston magazine devoted to religion and social culture, from 1865-1872. When the magazine folded, he turned to art, creating busts of his friends, including Walt Whitman and Ralph Waldo Emerson. He also toured the country lecturing, and while in Chicago in 1890, he wrote to a “Miss Porter,” possibly Charlotte Endymion Porter (1857-1942), who became the editor of the journal Poet Lore. As to Shakespeare’s being inadequate for America – it is America that is inadequate, as yet. But, year by year, Tragedies & Comedies of the great bard have been gaining ground. Here in Chicago when well-played, no plays draw so large and intelligent an audience. Why? Because people are unpatriotic? [un]democratic? Fudge! John Wilkes Booth (1838-1865) is today remembered as the Confederate sympathizer who assassinated President Abraham Lincoln at Ford’s Theatre in Washington, DC on April 14, 1865. Yet at that time, he was a well-known actor. Booth came from a prominent acting family. His father, Junius Brutus Booth, Sr. (1796-1852), had a substantial career in England before emigrating to America, and his brother Edwin Booth (1833-1893), was the most famous actor in 19th-century America. Like Edwin, John Wilkes made his stage debut in a supporting role in Richard III (in Baltimore in 1855). 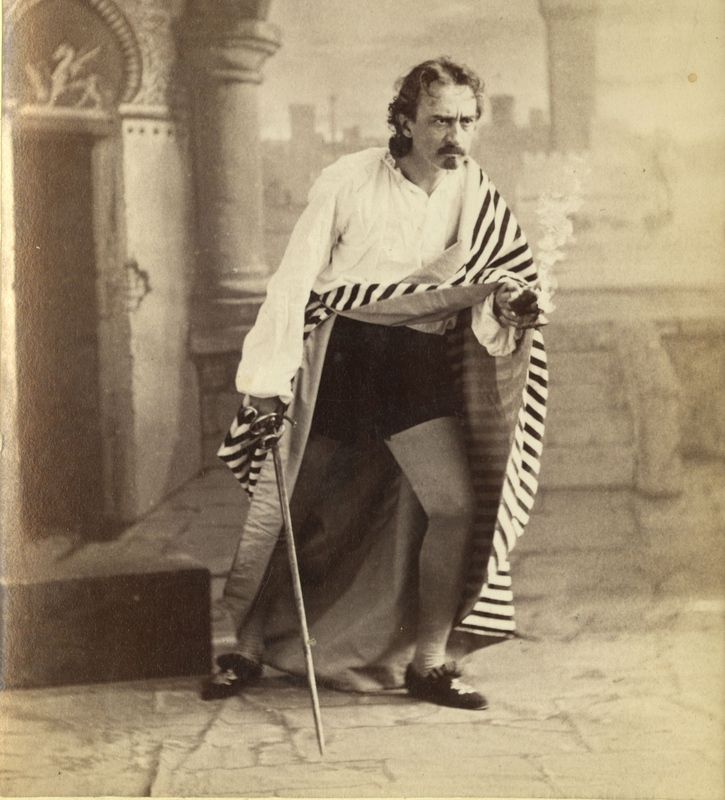 In 1862, he made his New York debut, as the lead in Richard III, with the New York Herald pronouncing him a “veritable sensation.” When describing his natural inclination for the role, Booth tellingly declared, “I am determined to be a villain.” His enthusiasm and physical performance style (he was particularly adept with a sword), soon won over audiences, and later that year he embarked on his first national tour as a leading actor, gaining acclaim everywhere he went, both for his good looks (one critic called him “the handsomest man in America”), as well as for his acting, with some naming him the “real genius” of the Booth family. Reviewing his Chicago debut in January 1862, the Chicago Tribune hailed him as a worthy successor to both his father and brother and claimed that “no genuine lover of the legitimate drama and old school acting, [will not] hail the advent of this new star.” Booth returned to Chicago in June, where he was “the rage in theatrical circles,” and the Tribune declared: “No actor has ever gained a firmer hold upon a Chicago audience.” Despite this initial acclaim, Booth never achieved the status or popularity of his father and brother on the stage. According to a playbill from McVicker’s Theater in Chicago, Booth starred as the lead in Othello, most likely in blackface. The role seems an unusual choice for Booth, who held strongly pro-slavery views; that he performed it in Illinois, the Land of Lincoln, is even more astonishing. Two days after playing Othello, Booth was scheduled to perform in Macbeth, supposedly his favorite play and, ironically, also the favorite of Abraham Lincoln. Shakespeare captivated Chicagoans not only on the page and the stage, but at world’s fairs, parks, and other public places. Visitors to the World’s Columbian Exposition in 1893 enjoyed As You Like It performed on the Wooded Island in Jackson Park and admired a plaster model of a statue of Shakespeare by William Ordway Partridge in the Fine Arts Palace. The Century of Progress International Exposition of 1933-34, Chicago’s second world’s fair, offered Shakespearean spectacle along the lakefront near the Twenty-Third Street entrance to the fairgrounds. Chicago architects Holabird and Root designed a mock English Village for the fair, uniting reproductions of Shakespeare’s house in Stratfordon-Avon and the Globe Theatre in London with other Tudor structures. The village green featured performances of English country dances, while over 1,000 shortened versions of Shakespeare’s plays were performed in the fair’s Globe Theatre. Illustrated souvenir publications such as So You’re Going to Merrie England encouraged fairgoers to visit the village and remember their experience. Today, visitors to Chicago’s parks encounter Shakespeare regularly. Lincoln Park boasts a permanent, bronze version of Partridge’s portrait sculpture, while every summer brings outdoor performances by the Chicago Shakespeare Theater and many smaller companies to neighborhood parks throughout the city. “Stagecraft” refers to the technical aspects of theatrical production, including scenic design, stage machinery, lighting, sound, costume design, and makeup. Since the late 17th century, theaters have used stagecraft to re-shape Shakespeare’s plays for new audiences. From William Davenant’s moving scenery in the 1660s, to David Garrick’s hydraulic wig for Hamlet in the mid-18th century, to Charles Kean’s 1857 production of The Tempest (which included not only a car drawn by peacocks, but scenery so complicated it required 140 people to move it during scene changes), stagecraft has helped to define the ways in which audiences experience and understand Shakespeare. The Chicago Shakespeare Theater (CST) is a leading international theater company that attracts 225,000 audience members annually. Founded in 1986, the CST has been in residence at Navy Pier since 1999. It currently houses two stages: the 500-seat courtyard-style theater, inspired by the theaters of early modern England; and a more intimate 200-seat venue. The Yard, a new stage with a series of mobile towers that can be configured to seat between 150 and 850 people, will be completed for the 2017-2018 season. His costume was of gray and cherry—a strangely beautiful costume, and in some odd way a strangely sinister one. He let you see no more of Iago’s evil purposes than Othello saw…but that only increased the real satanic quality of his impersonation, of that beautiful figure in gray and cherry, darting like light amid the crowds, and flashing up at the Moor’s elbow. Today, costumes typically begin as sketches, evolving through creative collaboration of the director and the costume designer. The designer completes the costume through multiple fittings, beginning with a muslin mock-up; designers tailor individual costumes for both lead actors and their understudies. Wigs and facial hair, such as beards and mustaches, might be purchased or made in-house at the theater. In early 20th-century Chicago, actors or theaters could purchase ready-made wigs for Shakespearean characters from the Funk Wig Company: styles included a Hamlet pageboy and a slightly rakish Romeo. In the 21st century at the CST, wigs, like costumes, are made individually for each actor. Facial hair is often chosen from one of many binders, organized by style. It is hard to imagine a performance of Macbeth without Lady Macbeth’s bloody spot, or of King Lear without Gloucester’s gouged-out eyes. Most theaters concoct their own stage blood. The Newberry has boasted a Shakespeare First Folio among its holdings since 1890, when one arrived with the library’s first major purchase: a collection of over 2,500 volumes from the Cincinnati book collector Henry Probasco. While the Newberry still owns a First Folio today, it is not the Probasco copy. John M. Wing, benefactor of the John M. Wing Foundation on the History of Printing at the Newberry, was a fan of both Shakespeare and extra-illustration. The term “extra-illustrated” refers to books whose owners have added material to them, ranging from a single portrait, to thousands of engravings, lithographs, photographs, maps, or letters. Wing also included selfmade title pages that were tributes to himself and his book-making efforts. Wing had an office in the Newberry where he cut and pasted his books, often having them bound in the library’s bindery. In 1902, Wing extra-illustrated a small pamphlet by the American lawyer Robert G. Ingersoll (1833-1899), one of the most popular orators of the day. Calling himself “A Lover of the Bard of Avon,” Wing added hundreds of illustrations to the pamphlet, including a photograph and autograph of Ingersoll. Upon his death in 1917, Wing left his library, including his extra-illustrated books, to the Newberry. In 1964, the Newberry purchased another major collection, from the estate of Chicago hotelier and book collector Louis H. Silver, who had amassed a stunning array of early modern books with an emphasis on 17th-century English literature. The collection included not just a First Folio, but a number of extremely rare quarto editions of Shakespeare’s plays as well. Because the collection was so highly valuable, it was delivered to the library by armed guards. To help defray the cost of the purchase, the Newberry decided to sell duplicates from the collection at an auction held at Sotheby’s in London. As the Silver copy of the Folio was deemed to be in better condition, the Probasco copy was included in the auction; it was subsequently gifted to Bryn Mawr College in Pennsylvania. When Peter O’Toole arrived at the Newberry in 1997 to speak at the Chicago Humanities Festival, he was offered an impromptu peek into the library’s vault. After the staff showed him maps and a T.E. Lawrence book about Arabia, they brought out the library’s copy of the First Folio. When O’Toole grasped the book, he gave an impromptu performance of a speech from King Lear. O’Toole had first decided to become an actor after seeing Michael Redgrave as Lear in Stratford-upon-Avon. After graduating from drama school, one of O’Toole’s first professional performances was as the Duke of Cornwall in King Lear at the Old Vic Theatre in Bristol in 1956.